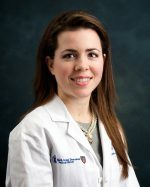 Vasiliki Moragianni, M.D., M.S., F.A.C.O.G. Vasiliki A. Moragianni, MD, MS, FACOG is board certified in reproductive endocrinology and infertility, as well as obstetrics and gynecology. Dr. Moragianni, a native of Greece, graduated from Cornell University with a B.Sc. in Human Biology and then obtained a M.Sc. degree in Physiology & Biophysics from Georgetown University. She received her medical degree from Drexel University College of Medicine and completed an OB/GYN residency at Abington Memorial Hospital in Philadelphia. Following her residency, she completed her Reproductive Endocrinology & Infertility fellowship at Harvard Medical School and Beth Israel Deaconess Medical Center in Boston. She subsequently joined the faculty of Harvard Medical School as Clinical Instructor of Obstetrics, Gynecology & Reproductive Biology, and was the Director of the International Patient Program at Boston IVF / Harvard Medical School. She later joined Fertility Solutions, a private practice with offices throughout Massachusetts and Rhode Island, and was named Top Obstetrician/Gynecologist by the International Association of Obstetricians & Gynecologists in 2013 and by the Consumers Research Council of America in 2014 and 2016. Dr. Moragianni has worked in private practice in the Northern Virginia area since 2015, before joining Dr. Mark Payson at CCRM Northern Virginia. She has authored over 20 peer-reviewed articles, has written numerous book chapters and continues to be involved in several clinical and translational research projects and presentations locally and around the world. Dr. Moragianni is an editor and reviewer for several journals, including Fertility & Sterility and Obstetrics & Gynecology. Her significant contribution to the fields of Obstetrics & Gynecology and Reproductive Endocrinology & Infertility is illustrated by the many prestigious awards she has received. Dr. Moragianni speaks Greek, French, Italian (basic) and Albanian (basic). In her spare time, Dr. Moragianni enjoys Greek folk dancing, traveling, and spending time with her family. Dr. Mark Payson is the Practice Director of CCRM Northern Virginia. He is Board Certified in Reproductive Endocrinology and Infertility and Obstetrics and Gynecology. He received his undergraduate degree from Harvard University and medical degree from Brown University. His undertook residency with the Navy at Walter Reed National Military Medical Center and completed fellowship training at the National Institutes of Health. Prior to founding CCRM Northern Virginia, Dr. Payson served as director of the IVF Program at Walter Reed until 2012, completing his military career as a Navy Commander. He then worked in private practice in the DC metro region. He has been involved in IVF research and published many papers in the field of fertility. He teaches medical students and residents and has received best teacher awards, as well as numerous accolades from his patients. Dr. Payson looks forward to helping you in your fertility journey and making it as straightforward and stress free as possible.